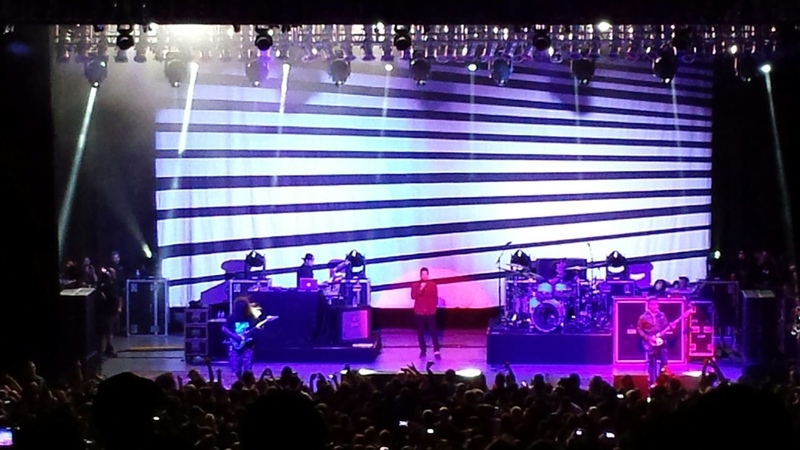 Deftones played a special Los Angeles show Friday at the Greek Theater. The reason it was special was because they had just come off of a tour supporting Avenged Sevenfold and this was the only show Deftones had scheduled after that tour, which ended only six days prior. Led by lead singer Chino Moreno, Deftones is: Stephen Carpenter on lead guitar, Sergio Vega on bass and backing vocals, Abe Cunningham on drums and Frank Delgado on keyboard, turntables and samples. The band opened their set with “Feiticeira,” off their album “White Pony.” From the first song onward the crowd stood on their feet, moved and sang along to every song. The band seemed to enjoy themselves while on stage. You can tell each band member was passionate about what they were doing and having a good time while doing it. They all interacted with each other as well. This is probably why the band has been together since 1988. Moreno is a great front man because he has a one-of-a-kind voice. It ranges from soft spoken, clean lyrics like in the song “Change (in the House of Flies).” He can also make loud screams, screeches and growls that go perfectly with the more loud, aggressive sounds of the band’s instruments on certain songs with additional backup from Vega. In addition to Moreno’s unique vocals is his ability to shred on guitar. He jumped on the instrument for various songs during the evening. Lead singers should show their music capability by playing instruments. The crowd loves it and I am sure the band will appreciate it as well. After about 95 minutes the band exited the stage and quickly returned for their encore, much to the delight of the 5,900 capacity audience. They went on to play “Engine No. 9” off their debut album “Adrenaline” and the crowd went insane. Finally, when their last song, “7 Words” kicked in (also off “Adrenaline), the crowd went even more berserk. Everyone was jumping and singing along to the band’s most popular and heaviest songs. It was the perfect way to conclude the band’s 105-minute affair with Los Angeles. This was an unusual venue for the band to play because the Greek Theater is usually prone to hosting heavy metal or alternative rock artists. But that did not slow down the Sacramento band. This has been Deftones’ only California show this year and is their first since they played the Hollywood Palladium last November. because its all about the singer!